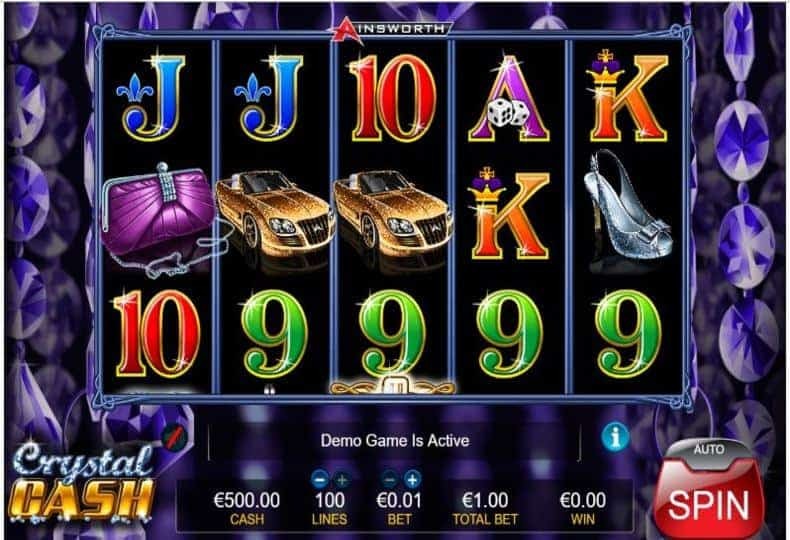 Themed on luxury, glamour and glitz, Crystal Cash offers 5 reels and 100 pay-lines. The game was adapted from a land-based machine and found great success in the online casino world. This Crystal Cash slot machine game is available to play in most Las Vegas casinos, including Bally's, The Golden Nugget and Harrah's. The sparkling reels include valuable symbols like designer shoes, purses, golden sports cars, perfume, expensive watches and jewellery. If you don’t get blinded by all the crystals in the background, you’ll also spot special symbols like a dollar sign which acts as Wild and a diamond which is the Scatter essential to the Free Games feature. The Wild appears in stacks, aside from replacing regular game icons, and only lands on reels 3, 4 and 5. The Free Games feature gets triggered with 3 or more diamond symbols anywhere on screen. As the round initiates, the reels are stripped of low value card symbols and left with high paying symbols only for 10 free spins. You can land extra winnings by collecting Wilds and Scatters during free play. Wilds introduce 2x or 3x multipliers, and more Scatters add 5 additional free spins. Crystal Cash pays out huge wins for luxurious goods. The most you can get credited with is 1,000,000 coins for five of the pendant symbols on a win line. Considering the game’s betting options, Crystal Cash is a true high-roller type of slot. As far as games go, Crystal Cash is good, but unremarkable and does not tend to keep players playing for long periods of time. In many ways it lacks the sheer fun of many of the most famous games in Vegas, like Buffalo and Cleopatra, because too much attention has gone into making it flashy and not enough has gone into the gameplay itself. Hopefully Ainsworth can get the quality of their games up to a higher standard soon and start to produce games as good as the ones made by Aristocrat and IGT, where so much attention is put on the actual enjoyment of the player, rather than the way the game appears on first sight.